Here’s a video of my first day at the Social Media Moms Conference. I will write in more detail about the information I learned about the wedding facility and the services Disney plans on providing over the next year when I get home, but just know it’s MAGICAL! I can tell you that Disney Cruises are now going to Hawaii!! I am just so excited to hear that! It’s my 10 year anniversary this year and I definitely have the ITCH to renew my vows on that puppy!!! what fun……wish we were there!!!!! Looks like a lot of fun! 🙂 Enjoy every minute! What a great video!! Thanks so much for sharing when I’m sure your super busy in *fun in the sun* Orlando! Looks like you ladies are having a fabulous time! Be sure to have some fun for me. Looking forward to more updates! I am going to admit it: jealous! 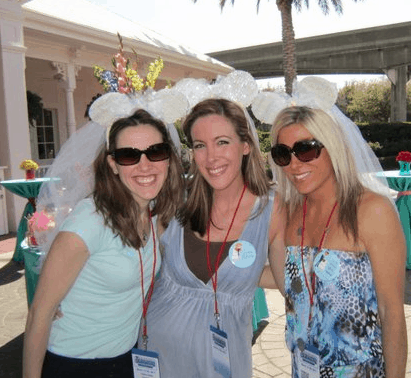 Dom and I actually talked about bringing some friends to Disney in October to renew our 10 yr vows. I bet they are booked for years ahead. What a fantastic recap of your first day! 🙂 Enjoy every minute of it!